Taking a day trip away from Florence is a plus when you are visiting Italy. 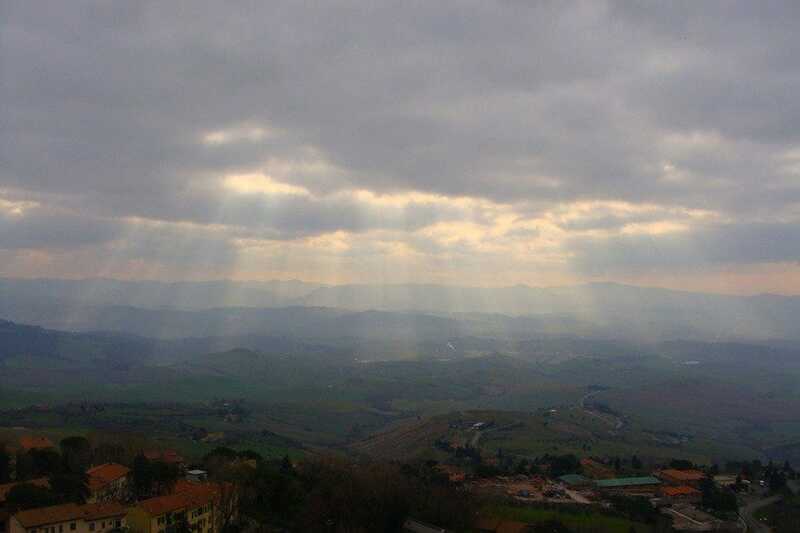 Volterra is one of those places you should visit. A magnificent hill town located 30 km from Florence and about an hour and half by car(depending on traffic), there are many attractions to explore while visiting Volterra. If you didn’t rent a car, you can take the SITA bus which will take you two hours because you will have to switch buses in Colle Val d’Elsa. Follow this link to see the route and where to buy tickets in Florence. To begin with the Piazza dei Priori is the central hub of the town, which houses the Palazzo dei Priori, Palazzo Pretorio and Palazzo del Podesta`. Palazzo dei Priori with it’s powerful tower, is the oldest town hall in Tuscany. The town council still meet here. The Palazzo was built in 1208 and it was finished in 1257. 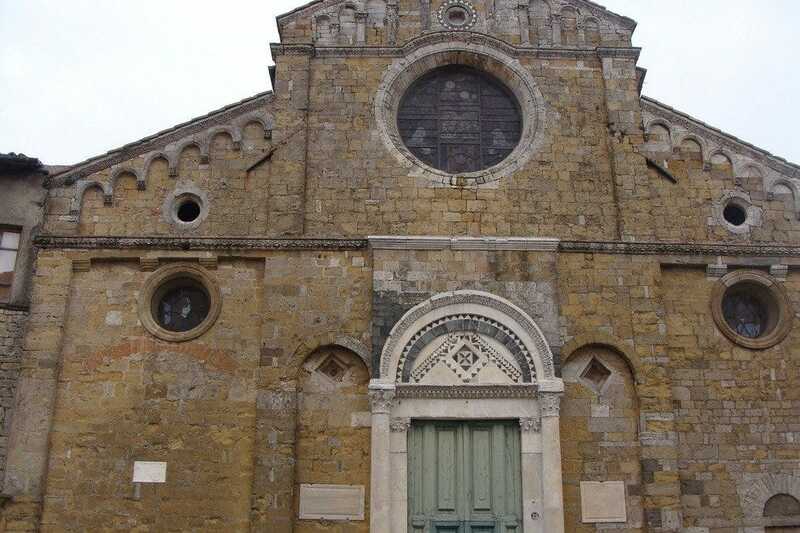 The gorgeous Basilica di Santa Maria Assunta - with its 12th-century Pisan style facade - s located in Piazza San Giovanni The lower part of the church was updated in the 16th century. Adding three large windows and a doorway which was decorated in the lunette (little half-moon shape) with green and white marble. The tall square campanile dates back to 1493. The interior was rebuilt in the latter part of the 16th century, it has a Latin-cross plan with five chapels. The nave and aisles were divided by columns of painted stucco and capitals by Leonardo Ricciarelli. 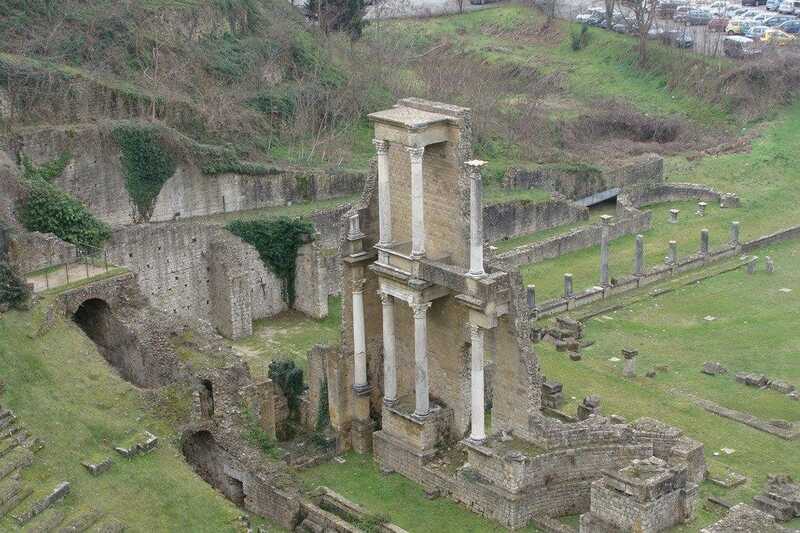 There is a Roman theatre located near the wooden gate, Porta Fiorentina, which was built at the end of the 1st century BC. It is one of the best preserved theatres in Italy. The excavations began in 1952 by Enrico Fiumi. He uncovered two tiers of Corinthian columns that are over 5 meters high. Inside the theatre can also be seen the remains of the Roman baths. If it is closed or you don’t want to pay the fee, you can see the whole scene from the street above called Via Lungo le Mura del Mandorlo. Via San Lino is one of the oldest streets in part of the oldest district of town. The church of San Lino has unique paintings and lunettes of the life of Christ by Cosimo Daddi. The tomb of the founder of the church Raffaele Maffei was completed by Silvio Cosini and is located inside. Via San Lino ends in Piazza Inghirami. The Inghirami family still owns the church of San Dalmazio, located in this piazza. The church has a Renaissance doorway that dates back to 1516 and an alter piece signed and dated 1551 by the artist, a local painter named Giovan Paolo Rossetti. The Etruscan gate or Porta all’Arco, sits behind Piazza San Giovanni and the baptistery. It was used as the main entrance to the town. 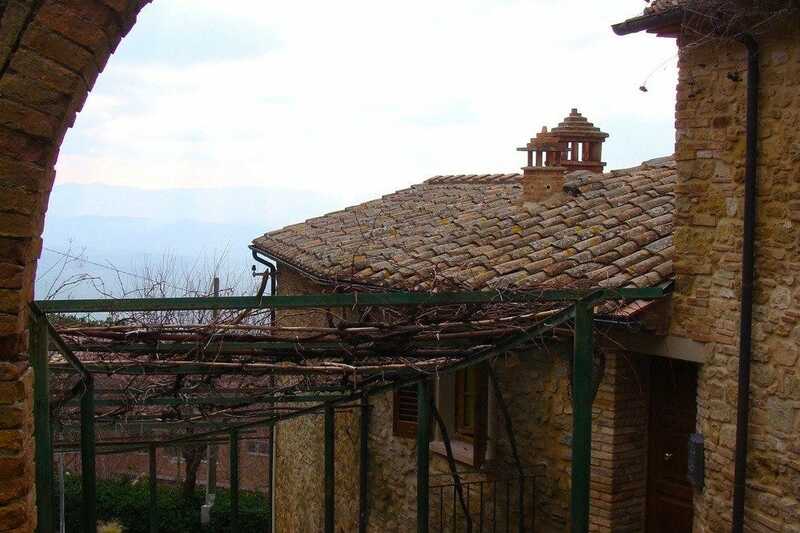 It dates back to the 3rd and 4th century BC and was partly rebuilt by the Romans in the 1st century BC. The round arch is decorated with heads of said Etruscan divinities. It is a strong treasure of the town in which it has persevered through sieges and war. In 1944, the volterrani (citizens of Volterra) filled the arch with paving stones to strengthen its resistance from shelling and bombing. The street below the arch, Via Porta all’Arco curves back uphill to the main square Piazza dei Priori. 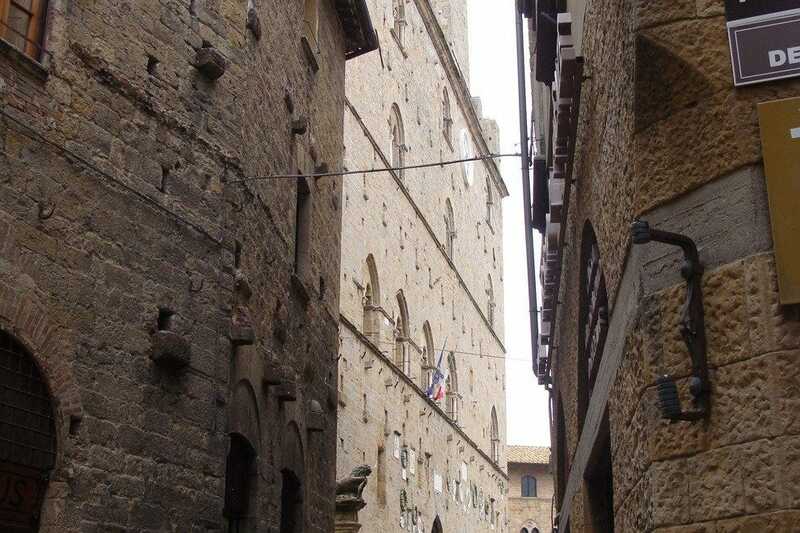 Volterra makes a great day trip for the whole family.